"...olive oil w/o the PUFA..."
What makes you say this? Table 2.2 (which lists the fat composition of the various diets) says the three diets (chow, stearic, and oleic) lists "% Other Essential Fatty Acids" as 74.9%, 13%, and 34%, respectively. EFAs are all PUFAs, aren't they? If I'm doing my arithmetic correctly, that means PUFA are 12.73%, 5.2%, and 13.94% of E, respectively. That difference may well explain the differing outcomes in the latter two. 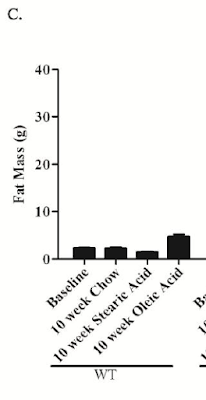 See also Figure 3.3.4, charting liver-fat accumulation. content was either in the form of stearic acid (85% of total fat) or oleic acid (67% of total fat)." Just putting an edit in.
" I spent some time failing to get the diet formulae from the manufacturers website (seems to have been some sort of takeover, from my browsing?)." "... The fat content of each diet was unique. The experimental diets were custom made by Harlan Teklad using a modified TD.03459 diet. A Harlan Teklad nutritionist calculated all dietary nutritional values." No worries. Keep up the good work! "The Cause of Metabolic Syndrome: Excess Omega-6 Fats (Linoleic Acid) in Your Mitochondria"
I tried to take out a level from your proton series, to the next step in the chain... I thought at one point you'd done a post comparing ROS generation from complex I vs. complex III, but couldn't find it when I was doing that post. Slightly off topic. I found this paper earlier today but haven't looked right through it yet for a quality check. It seems like a brave hypothesis to test in a journal of nutrition ie that sat fat causes less rise in a clotting factor than unsat. However I didn't notice any mention of the most effective way of lowering average TAG levels, a lower carbohydrate intake. Wait, ad lib feeding of different diets produced different weight gain & caloric balance? Witch-craft! Someone inform Stephan Guyenet stat! - "This suggests that the EFA requirement during and preceding pregnancy is about one percent of calories when supplied by lard or butter and one quarter this amount when supplied by liver." - "If an EFA requirement for most healthy adults on a mixed diet exists at all, however, it must be so low that it is essentially impossible to achieve a deficiency. During periods of growth or recovery from injury, animal fats providing 0.5 percent of calories as EFA are probably sufficient; and during pregnancy, animal fats providing one percent of calories as EFA are probably sufficient. On diets low in sugar and rich in vitamin B6, especially diets including liver, the requirement is almost certainly even lower than this." TL;DR Eat animals with the odd bits & avoid vegetable oils. I'm an old fashioned sort of guy - I like seeing a single variable in experiments (2 variables would take 4 groups etc). Surveys - the stamp collecting of science - are good science when they are used for inductive purposes in order to come up with a good controlled experiment. When we look at 2 feeds - with different oils made up of different amounts of various fatty-acids we are someplace between the two useful forms of scientific research - stamp-collecting and controlled experiment. These papers can easily muddy the water rather than enlighten us. How is it that they have become so common? If the feeds are from two different companies (as is often the case) we have differing base feed lots - further confounding any signal one might find in the noise. Is it just too expensive to use pure fatty acids? I just don't get it. I know "everyone does it", but real science requires that bending over backwards to eliminate even the slightest confounding variable. I really don't understand why such papers are published. That being said - I had another thought that needs a real experiment to clarify. I was thinking from the point of view of complex control loops (biology will use what works - even if it confuses biologists). It occurred to me that a set-point is likely involved in an integrating feedback - which smells a bit like leptin. But then I though further - what happens to the leptin output if the type of fatty acids stored is changed? And once in the adipose tissue - how long on a diet lower in linoleic acid would it take to substantially reduce the amount in storage? That led me to this paper and This one as well. So if I understand this correctly - messing with the amount of PUFA in the diet might screw up the leptin feedback - as well as inappropriately increasing insulin sensitivity. Stearic acid, clotting, and thrombosis. Stearic acid causes hypercoagulability of the blood by activation of factor XII and by aggregation of blood platelets. Injection of unbound stearic acid (sodium salt) into the systemic circulation of dogs was followed by massive generalized thrombosis and sudden death. Similar infusions into birds, which are deficient in factor XII, did not cause hypercoagulability or thrombosis. The effects of the long-chain saturated fatty acids could be prevented by using albumin to bind the stearic acid at a molar ratio of free fatty acid (FFA) to albumin of < 2. The major issue is whether eating foods rich in stearic acid can cause a thrombogenic effect. We have no experimental evidence to support this concept. If a thrombogenic effect of long-chain saturated fatty acids exists in humans, it is most likely to occur as an aberration of fatty acid transport in which the FFA-albumin molar ratio exceeds 2 either as a result of very high plasma FFA concentrations from lipid mobilization or a low concentration of albumin in the blood as found in disease states such as the nephrotic syndrome. You inquired how long it takes to deal with the excess PUFA in storage. I don't have an answer to that but I'd like to expand the question by adding in, what can we do to mitigate the damage as PUFAs are released? Obviously dietary SFA should help, is that enough? This is definitely of prime interest to those in the recovery process. Jimmy and karl, the issue of stored PUFA is very, very important. Sauer’s work with fasting omega 6 loaded rats showed this was catastrophic for cancer management. I posted about it here http://high-fat-nutrition.blogspot.co.uk/2013/08/starvation-and-cancer-growth-sauer-vs.html and http://high-fat-nutrition.blogspot.co.uk/2013/09/omega-3s-and-g-protein-coupled-receptors.html. Conversion of omega 6s to 13-hydroxyoctadecadienoic acid is really bad news if you have cancer. Acute weight loss on a ketogenic diet will spill large amounts of omega 6s from your adipocytes and these will be converted to cancer growth promoters, assuming you are overweight and have cancer courtesy of drinking corn oil… There may be some use for high level g-protein coupled signalling using DHA (gasp) to avoid this by minimising lipolysis, combined with minimising the weight loss so common with ketogenic dieting. Using stearic acid, or at least butter. Very interesting article. I do have one question, not entirely related to this. I drink water which is made by an Enagic Kangen machine. It says it has a ph of 9.5 and goes through electrolysis. It also claims it has extra electrons to scavenge free radicals. Do you think this would impact proper superoxide signaling in physiological insulin resistance ? There is evidence that antioxidants can cause problems with insulin signaling. Unknown, you are way beyond anything I've thought through. Except I hate exogenous antioxidants (unless you want to mess with your superoxide and hydrogen peroxide signalling....). If the exogenous electrons from the water bind to the superoxide, would there still be signaling or none at all? "Stearic acid causes hypercoagulability of the blood..."
Maybe if you main-line it. Stearic acid (the term comes from tallow, see Wikipedia) is what one finds in cattle. If my little dietary voyage has taught me anything, it's that if there's only one superfood, it's cattle. Maasai do just fine on an all-cattle diet, and the evolutionary evidence is that we're pretty uniquely adapted (among primates) to a high-ruminant diet. So I wouldn't lose sleep over your stearic acid consumption. The best I've come up with as a data point on FA turnover was an observation that Dr. Davis made about lowering Lp(a) with high dose fish oil. The thinking goes like this - long chain O-3(not plant based) blocks the bit that converts LA into AA ( do we really KNOW this?). He says patients with elevated Lp(a) would see it lowered over 6-mo to 2 years later. Now it is possible that Lp(a) simply represents an inflammatory state caused by AA - exchanging the stored LA with O-3s? Not much to go by - but 6-mo to 2-years sounds about right. I have to be careful thinking about this: circulating FA(Fatty Acids) are not stored FA. I'm thinking that the effect of stored FA coming out of storage may muck up the cells machinery differently. Our bodies take any excess carbs and convert them to 16:0 - really hard to think that we would have evolved 16:0 to make ourselves sick. Here is the confounding bit - the papers are mostly based on some food item. For example olive-oil - they call it a MUFA but it is also 10% LA. BUT olive oil is full of polyphenols which have all sorts of effects. Once again - there is a huge need to study pure stuff - single variable - calling olive oil a single variable is just junk science. Why can't we continue the synthetic diet research of the 1960's? - look a little below at the graphs - and I checked - the amount of PUFA in the diet continues to increase - a wild and uncontrolled human experiment. Really wonder if stored human FA was different before 1920? Does the LA get stuck in adiocytes? Is there a preference to which FA get released? I didn't find any research where they were trying to reduce LA in corn.. not on the mainstream radar yet..
Peter- I know you have more important things to do with your time-but if you write a book I'd buy it... thanks for your time in these posts! "The best I've come up with as a data point on FA turnover was an observation that Dr. Davis made about lowering Lp(a) with high dose fish oil. The thinking goes like this - long chain O-3(not plant based) blocks the bit that converts LA into AA ( do we really KNOW this?). He says patients with elevated Lp(a) would see it lowered over 6-mo to 2 years later." "Am J Clin Nutr. 1980 Jan;33(1):81-5. "A mathematical relationship between the fatty acid composition of the diet and that of the adipose tissue in man. 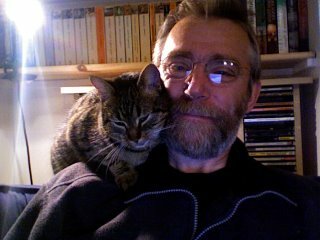 "Beynen AC, Hermus RJ, Hautvast JG. "Based on literature data, the hypothesis is advanced that in human subjects a direct mathematical relationship exists between the average fatty acid composition of the habitual diet and that of the lipid stores of subcutaneous adipose tissue. 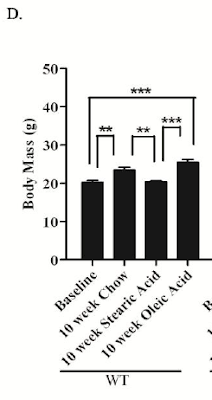 Since the half-life of adipose tissue fatty acids in man is in the order of 600 days, the fatty acid pattern of depot fat provides a qualitative measure of the fat intake over a period of 2 to 3 years." Stephan Guyenet, back when he was more concerned w/ PUFA intake, said the same thing, but I don't have time to look up the post. My personal experience was: the first thing I did on the road to Paleo was cut n-6 PUFA intake, thanks to Stephen's posts. My elevated liver enzymes normalized four years later, without a subsequent change of behavior after going fully Paleo a couple of months after cutting n-6. I've read that the elevated enzymes I had were indicative of fatty liver... So Peat's statement is true to my experience. "The thinking goes like this - long chain O-3(not plant based) blocks the bit that converts LA into AA ( do we really KNOW this?)" "Really wonder if stored human FA was different before 1920? Does the LA get stuck in adiocytes? Is there a preference to which FA get released?" Yes, LA concentrates in the tissues, especially adipose tissues, of non-ruminant species. Ruminants are grass-eaters, one expects their LA exposure would be highest, the fact that they alone have a rate-limiter is very suggestive. Again, Stephan Guyenet's done some posts (if he hasn't deleted them) on human PUFA adipose concentration. I think he even had a paper published on it. 600 days about 2-years - way longer than most people can stay on any diet. Supports Dr. Davis's guess pretty well. But there are a few 'Maybes' in that paper - and at lower levels it has not really helped much with CAD. ( The trouble is some blog theories get parroted as research - I always want to see the source.) If anyone can point me to some paper?? (I've seen competitive blockage of LA => AA by fish-oil in various forms in several places - never with any reference ). I would like to see that graph next to obesity rates over the same period.. (correlation is not causation - but it sure begs for some careful experiments ). For LA concentration there would have to be one of the following - fails to be released from adipose tissue, is preferential stored in adipose, fails to get used as fuel. Again - I'm reluctant to think about PUFAs as a single 'thing' - there are various forms - LA is just one form. My original entry into the different types of FA came from oxLDL and it's different stimulus of the immune system than the plain old LDL that so many blather on about. When I saw that LA greatly increases oxLDL I changed my treatment for CAD. ( I was able to get to the lower 5-percentile of the public for oxLDL in my blood tests - I have a fair amount of faith that oxLDL stimulates recruiting of macrophage that turn in to foam-cells. ). It is curious that LA, one substance, mucks up so many things, yet is still "generally recognized as safe(gras)".
" If anyone can point me to some paper??" "...Overall, conversion of deuterated 18:3(n − 3) and 18:2(n − 6) was reduced by 40–54% when dietary intake of 18:2(n − 6) was increased from 15 to 30 g/day. Comparison of the deuterated 18:3(n − 3) and 18:2(n − 6) data for plasma triacylglycerol and phosphatidylcholine (PC) indicated that 18:2(n − 6) was preferentially incorporated into PC. Dietary 18:2(n − 6) intake did not alter acyltransferase selectivity but activity was reduced when 18:2(n − 6) intake was increased...."
"Dietary linoleic acid influences desaturation and acylation of deuterium-labeled linoleic and linolenic acids in young adult males"
"(correlation is not causation - but it sure begs for some careful experiments )." "Dietary linoleic acid elevates endogenous 2-AG and anandamide and induces obesity"
"Dietary linoleic acid elevates endogenous 2-arachidonoylglycerol and anandamide in Atlantic salmon (Salmo salar L.) and mice, and induces weight gain and inflammation in mice"
"I see LA content in adipose tissue is going up - so is consumption - where did you see that it 'concentrates'?" "Three groups of 15 female pigs were fed diets containing 0.8%, 1.1%, or 1.8% linoleic acid from 20 to 35 kg followed by 1.0%, 1.2% or 1.4% linoleic acid respectively from 35 kg to slaughter at 85 kg live-weight.... The mean proportions of linoleic acid in the backfat lipids were 8.6%, 11.0%, and 13.9% respectively as the amount of the diet increased. There was a significant correlation between the concentration of linoleic acid in the inner backfat lipid and P2 backfat thickness for those animals on the high and medium linoleic acid diets but not for those on the low diet...."
"The effect of dietary linoleic acid on the firmness of backfat in pigs of 85 kg live weight"
"It is curious that LA, one substance, mucks up so many things, yet is still "generally recognized as safe(gras)"." Science moves incredibly slowly, medicine even more so. Most doctors follow "science" that's several decades out of date, if you're lucky, or that was never "science" in the first place, if you're not. Just a passing thought in view of all this - you know I'm a fan of the non-sequitur, but If one wanted to minimize stored LA it seems that there are two contrary approaches. The precondition for both is to avoid consuming it. Then one approach is to only eat palmitic and stearic etc based fats; the other is to not eat any fats at all but to let your body manufacture palmitate from starch and let the resulting insulin levels drive it into your adipocytes. If you have existing stores of LA however you're probably better off minimising the insulin. I gave up being embarrassed by my idiot countrymen a while ago, but it seemed sort of apt to throw this in. Well, maybe not, but it has the word "mice" in it. Pass, yes, if you already actually have cancer you certainly don't want to spill your omega 6s. They don't say who made the diets - but looking at the 'supplementary info' the format suggests they come from different companies.. and the control diet doesn't list sugar - but the low-carb one does.. the diets are not listed in a way that one can compare - and if I read this correctly the control diet has no sugar.. This is a long way from science. What do you think about the conclusion of this paper that Stearic Acid is less well absorbed and excreted at higher rates? Does this explain the lower metabolic rate? And is there something to the difference in way it oleic vs stearic acid are absorbed that would create this effect? The stearic acid is very interesting. Poor fat absorption, lowered metabolic rate, massively improved glucose control. Even if used as a rescue diet once diabetes was established. There's a lot to consider here. If stearic acid was a marketable drug we'd be hearing its marvels trumpeted from the rooftops. Interestingly the Aussie idiot of the NZO mouse infamy used stearic acid along side table sugar to injure his rodents. Topical. It certainly helps db/db mice, so long as they skip the sucrose I suspect. I assume that the effects gained by virtue of higher excretion of stearic acid are more complicated than this but do you think this is simply benefits of calorie restriction? Without getting too Lustig about it this article has some interesting thoughts abouts rats fructose uric acid and i.r. "The stearic acid is very interesting. Poor fat absorption, lowered metabolic rate, massively improved glucose control." Is lowered metabolic rate a good thing? FFAs don't always correlate to dietary fats. E.g., eat pure fat, no insulin response - even later when FFAs rise. But inject FFAs - insulin response. There are factors modifying the response to dietary fat that mean some effects of pure FFAs are not relevant when considering it, yet others are. @Tucker, it seems to me the mitochondrial benefit of EFA restriction is only going to be seen at very low intakes (<2% or <3%) and won't account for differences when control diets are "adequate" in LA. George, there was one commenter here a while ago who was making fatty acids from triglycerides and consuming them with interesting results ie make the fat into soap, precipitate the glycerol and separate it, then turn the soap into pure fatty acids. Have you any references to the effects of those as dietary inputs? I think that should be 'precipitate the soap etc etc'. I need to brush up on my kitchen chemistry. "@Tucker, it seems to me the mitochondrial benefit of EFA restriction is only going to be seen at very low intakes (<2% or <3%) and won't account for differences when control diets are "adequate" in LA." I think that's right. This paper (abstract only) makes that point in pigs. "We also found that traces of hydroperoxides and a high concentration of the target unsaturated fatty acid (LA) needs to be present in a fatty acid mixture before the quasi-lipoxygenase activity of Cyt c becomes apparent." "Effect of cytochrome c on the linoleic acid–degrading activity of porcine leukocyte 12-lipoxygenase"
So what's "low" and what's "adequate"? If the "adequate" level causes pathological changes, then that level should actually be considered "too high". I suspect what you characterize as "low" is actually "adequate" and "normal". That's also the level one finds in animals that are well-adapted to consuming high amounts of LA in their natural diet. One adaptation to the consumption of high amounts of LA is its rapid conversion to cholesterol and saturated fat. Almost certainly applies to TG fats as well. Lovely paper George. I need to digest it several more times before i can make sufficient de novo understanding from it. I wonder if there is a market for broccoli oil? Hadn't seen this - good to see someone else figured out the topic was extremely over simplified. There is an associated mantra about "balancing O-3 with 0-6" - My take is that it is entirely possible that besides the LA => AA pathway there might be separate problems with excess LA - Protons: FADH2:NADH ratios and other pathways that produce things like 4-hydroxynonenal - balancing may help - but sure seems prudent to limit intake of LA to something close to the 1960's levels. Re: "This sort of thing:"
It struck me that Stephans old graph suggests that the amount of LA in human fat has increased in magnitude similar to the amount of total excess fat people carry. Is this just a coincidence? Of course not proof that LA is what is making people fat - but it sure demands more attention than it has gotten. Imagine - what if we could remove the excess LA people carry - would we still have a obesity pandemic? Is there something about LA that causes it to be retained in preference to other fatty acids? After reading the 'essential' paper from George I was going to suggest that the rapid burning, converting or storing of LA was remimiscent of the way fructose is handled. Not literally but in the 'get rid of it quick' sense ie you don't want it hanging around loose. "...the rapid burning, converting or storing of LA remimiscent of the way fructose is handled...."
In some respects, in others not so much. We read a lot about "oxidative damage" and the importance of anti-oxidants to help the body deal with oxidative damage. It's involved in every aspect of the metabolic syndrome (which includes some types of cancer, Alzheimer's, ad nauseum). The oxidative damage referred to is the result of the fact that LA is preferentially incorporated into the mitochondria, where it alters the fundamental way they work, generating that oxidative damage. The primary marker for oxidative damage is a chemical, 4-HNE, which is only generated from LA or AA. So 4-HNE is a marker for excess, toxic, LA consumption. So the next time you see "oxidative damage", replace it with "LA poisoning", and see where that takes you. It's far more sinister than fructose, which, in the absence of oxidative damage, doesn't seem to be harmful at all. But why? Im certain this involves another one of those J curves ie not to little, not too much,just right. Problem 10 in Cunnane2003 - some la is synthesized from 16 chain fa's. So that is not de novo synthesis but synthesis nonetheless. Again why? Sorry that's item 10, problem 8. "Im certain this involves another one of those J curves ie not to little, not too much,just right." Agreed. "just right" is likely in the neighborhood of 1-2% E, not 7-15% E, as in the Modern American Diet. What if we look at why LA is preferentially stored in adipose tissue first? Let us do sort of a thought simulation(thought experiments are an oxymoron) - lets go back to Petro's protons. 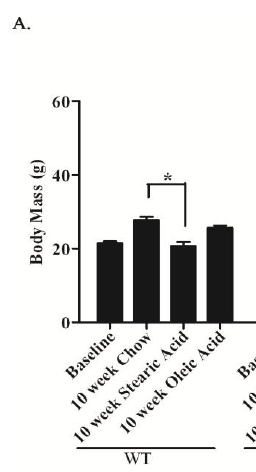 Someone eats a meal particularly high in LA - some of the LA enters our adipocyte - this adipocyte needs ATP - burns some of the available FA - high in LA and thus induces inappropriate insulin sensitivity - increasing the amount of FA uptake exactly when the ratio of LA is particularly high. So what gets stored over various meals has a high ratio of LA. Changing the ratio of O-3(long chain?) and o-6 may have consequences - even with major histocompatibility complex (MHC) my take is balancing the ratio is only a band-aid - we probably want levels that we were likely to evolved to use. "...we probably want levels that we were likely to evolved to use." "Higher intake of specific types of fat--including vegetable, monounsaturated, and polyunsaturated fats and linoleic acid--rather than total fat intake may be associated with a greater risk for advanced AMD. Diets high in omega-3 fatty acids and fish were inversely associated with risk for AMD when intake of linoleic acid was low." "..."Age-related macular degeneration (AMD) is the most common cause of legal blindness of elderly people in the world...."
I wonder if the location of the fat cell matters? They tend to be thought of as outermost but not all are. Core fats in land animals where the local temps are higher are more saturated whereas peripheral fats are less so eg the canonical boot polish, neatsfoot oil which used to be rendered from cowlegs, has a much lower sat fat content. (but which ufa?) Likewise the fats of sea mammals being less saturated etc. Another LA vs general nastiness paper, sorry if this has come up before but it looked too good to ignore. Is the LA level high in T2d for the reasons you're discussing here ie dietary plus storage, or ??? @Passthecream: "Is the LA level high in T2d for the reasons you're discussing here ie dietary plus storage, or ??? " I did this post a while back, one of the things they discuss is the correlation between the LA metabolites they're looking into and T2DM. So yes. 4-HNE is produced by the either carb-induced or self-oxidation of LA in the mitochondria. 4-HNE is toxic, full stop. It's not the only toxic LA metabolite, there's also acrolein, which is apparently much more toxic, but most of what I could find was about 4-HNE. "The Lipid Peroxidation By-Product 4-Hydroxy-2-Nonenal (4-HNE) Induces Insulin Resistance in Skeletal Muscle through Both Carbonyl and Oxidative Stress"
There was some derisory comment above. George dealt with it very neatly at his 'hopefulgeranium' blogspot. "I'd love to have your views on this"
LOL. Everything is wrong w/ that study. 6% sucrose isn't "paleo", for starters. Those mice also get fat regardless of what you feed them. "Of mice and men, again"
"Campaign to Have “Paleo” Mouse Study Retracted"
Don't confuse that paper with real science - the important information is hidden away in the supplementary information. If you look at the dietary contents - the format shows that these are not even from the same company - using differing feed lots prevents one from having a single variable(one of the things you see in real science). There is no analysis of the amount of LA in the diets. It is well known that LA + sugar makes mice fat. This paper should not have been published - should be retracted. (There are two basic forms of science papers - and they really don't mix - one is stamp-collecting - the collection of data from which one might infer a hypothesis - the other is experimental science - where one tries to test a hypothesis - and that requires single variable experiments - which this failed to even come close to. ). The real question is why was it published? What possible motivation do they have to simply muddy the water? Who is getting money? Where is it coming from? Are PETA people involved? "The real question is why was it published? What possible motivation do they have to simply muddy the water? Who is getting money? Where is it coming from?" "This research has led to the hypothesis that increased insulin secretory demand may be a mechanism that contributes to diabetes and that strategies that promote metabolic deceleration may be beneficial." "A/Professor Andrikopoulos is the current President of the Australian Diabetes Society." Hi, I have a question that might seem stupid because Peter might have already answered it. I can't seem to find it even though I am avid reader of his blog. Does physiological insulin resistance cause increased insulin levels ? @Leo: "Does physiological insulin resistance cause increased insulin levels ?" No. T2DM insulin resistance does, insulin goes down on LC, which causes physiological IR. '....current President of the Australian Diabetes Society." I hope it is not complitely off topic guys, but I just wanted to share some article from Russion language news outlet translated into English https://translate.google.com/translate?hl=en&sl=ru&u=http://www.svoboda.org/&prev=search about the the substance just added to the WADA list of banned substances. The unusual thing - it was initially created with the purpose to utilize a rocket fuel.
" Meldonium - an international name of the drug, which is produced in Latvia. Its trade name "Mildronat". It was created by the Institute of Organic Synthesis in conjunction with the Second Moscow Medical Institute to help patients with heart disease to survive the hard times when, for whatever reason, they have deteriorating blood supply to the heart muscle. Synthetic substance - a copy of the natural substance with a very small change, one carbon atom is replaced by a nitrogen atom. A natural substance called gammabutirobetain it in our body is a precursor of carnitine, and that, in turn, - fatty acids through the mitochondrial membrane transporter, there is the formation of the cell, to the place of their oxidation, that is, to generate energy. We assumed that this mechanism only works if there is enough oxygen when the heart can oxidize all fatty acids, which it supplied with blood. Once the oxygen starts to miss, these oxidized fats simply accumulate inside the cell. Fatty acids, activated using carnitine like detergent, i.e. soap. Since all the cell membranes are composed of lipids, i.e. fat base, they are dissolved, and a cell is destroyed. The idea was that if we slow down biosynthesis of carnitine, and will contribute to its removal from the body, then the lack of oxygen, or ischemia, the heart muscle does not die. It worked. there are now two opposing camps in the world: some argue that it is necessary to use carnitine, it promotes energy production, while others say that it is good when a sufficient amount of oxygen, and then brings harm.The medicine we first booked in the Soviet Union in 1984. The drug is one of the most popular cardiovascular agents in the former Soviet Union, and there are two reasons. Firstly, this product has virtually no side effects, it can be used for years, and the sick and healthy, everyone is state of crisis, stress overload. Secondly, we have created the world's first and so far only with the action of the drug mechanism that helps millions of people to survive in an environment where their heart should have been killed. And not only the heart. The peculiarity of its action is that energy production in muscle cells from the combustion is switched from burning fat to burning sugars. And when we burn sugar, we save oxygen, but spend carbon." Why isn't this drug on the USA market? Here is the mind numbing bit - as Melduonium got banned - why not metformin as well? There are safety issues and a lot of research that needs to be done to bring this to market in the western world - might not happen due to politics. There are other ways to reduce oxLDL - I don't eat much LA and use a few other dietary bits that have gotten my level down to about 5-percentile of the general public. I just thought you guys may find the article interesting. There are some interesting meds in Eastern Europe, not available in US for legal reasons. It looks like most Eastern European sportsmen were on it. I personally found it interesting that the drug researchers thought than the inhibition of L-carnitine biosynthesis and transportation was cardioprotective. Here in US it is a beloved bodybuilders supplement. I see that sales of meldonium have shot through the roof since it was banned! Miss the posts Peter. off topic perhaps but what about K2 (MK4 and MK7 respectively) and D3 assisting calcium absorption?